Butter, bacon grease, or other fat for cooking. Dice potatoes and place in oven-safe dish. Toss with garlic and a few pats of butter, spoonfuls of bacon grease, or drizzle of oil (or a combo, I did butter and bacon grease). Bake in oven at 400 degrees, until potatoes are soft and done to your liking. Meanwhile, cook the bacon until crisp. Crumble bacon when cool enough to handle. Steam the brussel sprouts until tender. set aside. 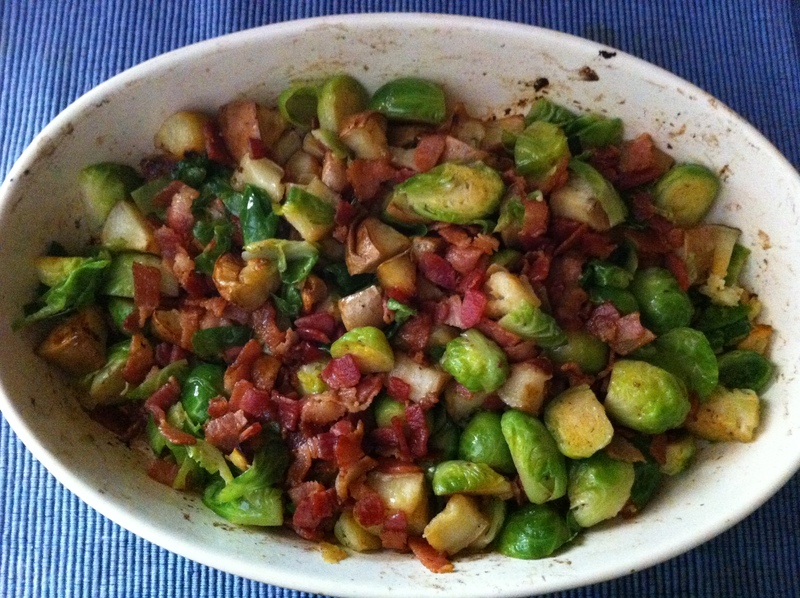 When potatoes are done, just add in bacon and brussel sprouts and combine them all. BAM! Done! You don’t even need much additional seasoning because the bacon adds the saltiness and the flavors meld really well (in my opinion).